Laundry detergent research conducted by various individuals over the years has cultivated a rich history of a common household product we use today. Below you'll read a bit of this history, as well as tips and tricks for finding the best detergent for you and your family. While the first soaps were developed in ancient times, the artificial soap that is known as laundry detergent today was created by the Germans during World War I. In 1946, the first commercial detergent was sold in the United States, made out of a certain type of soap flakes and a builder, which is a chemical that ramps up the performance level of the soap and brings more effectiveness to laundering. This first laundry detergent was extremely popular, especially when the price of washing machines went down significantly after World War II. By the mid 1950s, there was more laundry detergent being sold than actual body soap which had been the number one cleaning agent on the market for years. Also confirmed in the history of laundry soap is that it isn't really soap at all. Instead, it is a combination of synthetic components that works to attach itself to dirt and other stains and residues, and chemically separates them from the clothing. Combine this with the agitation and rinse cycles of a common washing machine, and the cleaning process is both thorough and effective. While almost all laundry detergents on the market will work well to clean your clothes and get the job done, use and research has proven some to contain extra perks. From fresh scent to special additives, below is a list of researched laundry detergents that came out on top in various categories. Tide is a favorite pick by many family members in charge of laundry duty. It pretreats, soaks and removes stains more effectively than most other detergents on the market. While not always the most affordable option, it is guaranteed to work hard at getting out those difficult stains when you may feel there's no hope. From fresh rain to springtime flowers, there seems to be a variety of laundry detergent scents more vast than your wardrobe itself. When you're looking for a winning smell to enjoy while folding your clean laundry, try out Gain's Joyful Expressions. There are a few different scents to choose from - throw some Apple Mango Tango in your next laundry load. Everything green is "in" right now, and detergent is no exception. Method detergent is a brand that is not only space efficient in your laundry room, but is also fully biodegradable and is free from animal testing. You can also purchase an even gentler baby formula for your tiniest loads of laundry. All Small and Mighty came out the best in research when looking for the largest effects with the smallest amount of detergent. Try their high efficiency formulation for the ultimate cleaning experience. As if cleanliness, softness and scent weren't enough, Cheer has come up with TrueFit, which works to maintain the shape of your clothes through the laundry cycle. No more shrunken sleeves or ruffled cuffs with this stuff - it cleans and preserves the special look of your favorite outfits. Even though critics and consumer reports have published extensive results of laundry detergent research and tests, it never hurts to do a little bit of your own investigating. 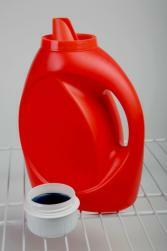 Visit the website of various laundry soaps, or go online to major retailers such as Wal-Mart. Many times these will supply you with trial size offers of a specific product, so you can do a test wash before you purchase the full size. This allows you to save time, money and get the best results with whatever you decide to settle on.